Most of us DIYers know that the thrift store (or a flea market) is a real goldmine for cheap but unique and sometimes outright awesome home decor pieces. Be it a fancy picture frame, an old chair that only needs a little touch-up, or an interesting vase. These things have a story behind them and tons of character which you can bring home and make your decor truly unique. If you like to frequent thrift stores yourself, here are some of the most creative projects you can do with things that you can often find there. These DIY crafts are really inspiring and you will definitely get new ideas for your next shopping visit. Some of these projects require only a small touch up, other transform the finds completely, but the end result is always marvelous. 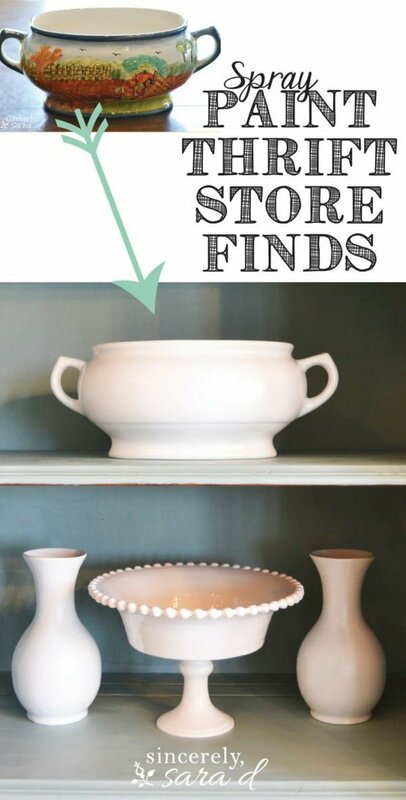 You can always find various jars, vases and other containers in thrift stores and flea markets. Usually they catch the eye with their interesting shape but otherwise worn down look. All you have to do is paint them to transform that look. This tutorial is for the farmhouse or shabby chic look which fits perfectly the things you can find in thrift stores. You don’t need to be fancy with your thrift store finds to get attractive decor pieces. Simple spray paint job is all it takes for simple but interesting vases, cake stands and other containers. And while this project doesn’t really need much of a tutorial, check out some tips and ideas for the look. 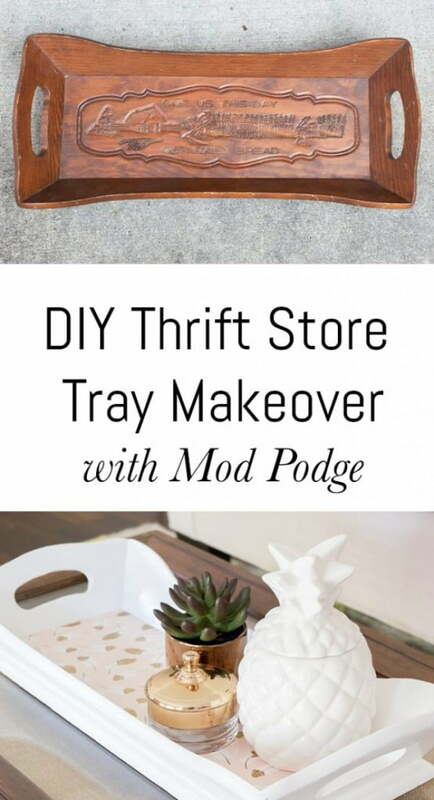 This DIY project is for giving an old tray a face lift with mod podge. This way you can even out any scratches or unwanted embellishments for a slick new look of an old thing. Check out the tutorial to see how an old beat up tray becomes a piece of classy decor. Various picture or mirror frames are real gems in thrift stores. Usually, you’d pay a top dollar to get something intricate if you were shopping in regular stores. But find a cool frame and you can transform it into something fabulous, such as this chalkboard. Check out the tutorial for the French rustic look. If you can find interesting candlesticks in a thrift store or a flea market, they may be the perfect fit for attractive cake stands. These can be used to decorate your kitchen and store fruit, linens or other small items. Check out the tutorial for the full story of how this project came to be. Transform any basket found in a thrift store into an attractive rustic rope basket. It’s a brilliant DIY project and an easy tutorial that you can use on any find. This way you can transform just about any container, be it a bucket, a vase or a planter. This is one of the most creative projects reusing materials for adorable decor. These decorative pillows are made of old sweaters, and needless to say, there’s an endless supply of them in thrift stores. Check out the tutorial to see how it’s done. 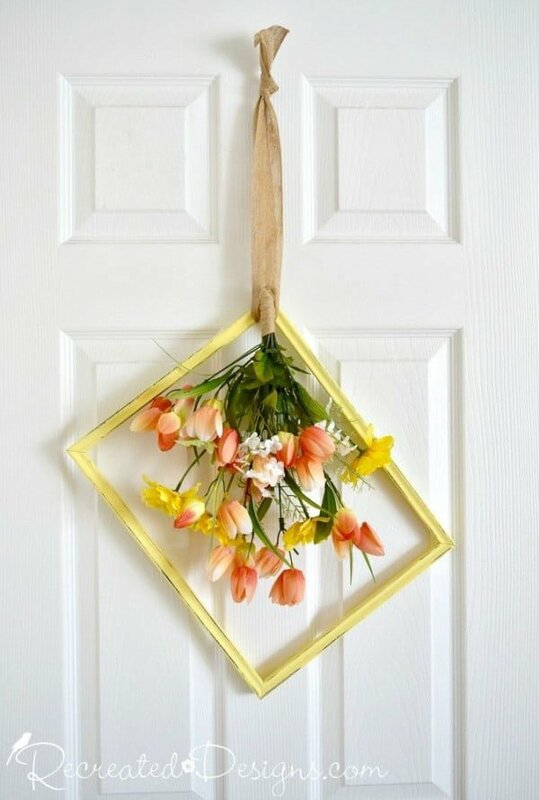 Here’s another creative way to use an old picture frame that you can always find in thrift stores and flea markets. This wreath looks lively and whimsical – a truly unique piece of home decor. Check out the tutorial to see how it was done. Any thrift store is a great source for vintage items. So if you’re looking for that small but high impact vintage accent for your home decor, you can easily find it there. Here’s how to make an adorable caddy for your decor vignettes or centerpieces from thrift store finds. There are many things you can use to display your jewelry, you just have to be creative. This tutorial will show you several thrift store finds that can be used for a beautiful jewelry display and organization. Chances of finding some random storage box in a thrift store or flea market are high. The options of transforming it into something useful are many. Here’s a DIY project for your own indoor herb garden that looks very chic. Check out the tutorial for instructions. This is quite a unique thrift store find – a decorative cheese dome. The DIY project is to turn it into a succulent display. It’s absolutely adorable so we’ve included it here. Look out for something similar and maybe you can get one for your home decor as well. This is one of the most creative DIY bookshelves we have ever seen. It uses some old books and beautiful corbels that add architectural interest to this decorative shelf. You can use it for display as well as to keep some small things at home. Follow the tutorial for instructions. 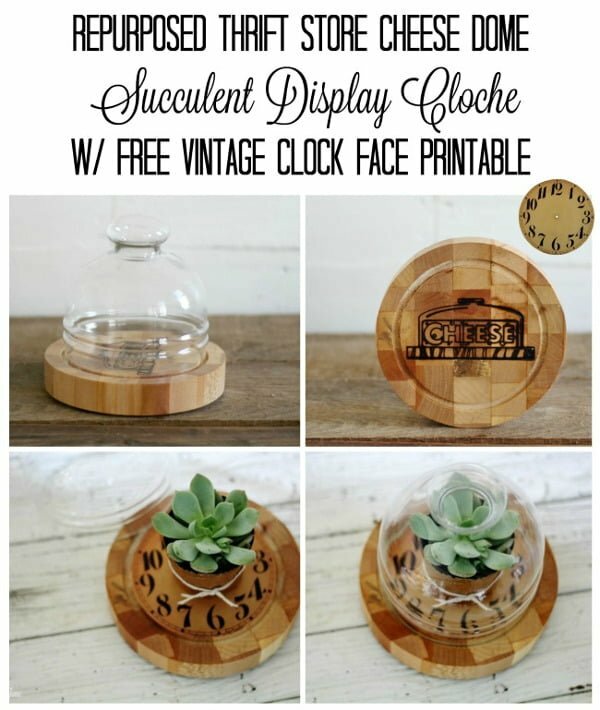 Another very simple DIY project to transform unremarkable thrift store finds into fab decor pieces. Just use some gold spray paint to get this look. The tutorial has all the details about the project. If you like the farmhouse style, you will love the idea of making your own decorative metal buckets for storage and display. This tutorial will show you how to get the look from a simple galvanized metal bucket found in a thrift store.